The following is a guidebook to “Clean Drains for food service establishments”. It was put together in an effort to assist food Service personnel in developing Best Management Practices (BMP) to help reduce Fats, Oils, and Grease (FOG) from entering both the customers sewer service and the City of Ashland’s sanitary sewer system. While this guide may not establish all BMPs available to Food Service Establishments (FSE), it should give a starting point to work from. If you have any questions or concerns regarding this brochure or the City’s program to reduce FOG in the sewer systems, please contact the Wastewater Systems/Water Re-use Supervisor for the City of Ashland at 541-552-2335, or contact by mail at 90 North Mountain Avenue, Ashland, Oregon, 97520. <?xml:namespace prefix = st1 ns = "urn:schemas-microsoft-com:office:smarttags" />Ashland. The City also has the responsibility of providing adequate sewer service for its citizens. Sewer blockages and subsequent sewage spills pose a threat to public health and safety that can be prevented when Food Service establishments (FSE) follow the Best Management Practices (BMPs) presented in this guidebook. Studies have shown that sewer blockages are usually caused by an accumulation of fats, oil and grease (FOG), roots and debris intrusion, or a combination thereof. Blockages reduce capacity in the sewer lines and can result in sewage spills onto the City streets or private property. This Best Management Practices Guidebook has been developed to provide FSEs with information on how to minimize the amount of waste FOG introduced into the sewer. FOG bearing materials, among others, include: cooking oil, fat, lard, grease, butter, tallow, shortening, and margarine. Kitchen waste containing these materials, as well as water that has been used to wash kitchen equipment and floors, contains waste FOG. When waste FOG is poured down the drain and into the sewer lines, it cools and solidifies restricting or clogging wastewater flow. The FOG accumulation in the City sewers has resulted in increased sewer maintenance by the City Wastewater Department. Maintaining the City's 105 miles of sewer lines is a major task. To address this problem, the City has adopted an aggressive maintenance program to frequently inspect and clean the sewer lines. However, the City has determined that the most effective way to minimize FOG accumulation in sewers is to prevent the introduction of FOG into the sewer system in the first place. To realize this goal, the City is developing a FOG Control Program that regulates FSEs and provides them with a mechanism to help control and minimize the introduction of FOG into City sewers. Public and industrial outreach programs educate citizens on the problems associated with improper disposal of FOG and encourage the application of BMPs in handling of waste FOG. The industrial wastewater control element provides the City, through the source control ordinance, with the authority to inspect and monitor the implementation of BMPs. 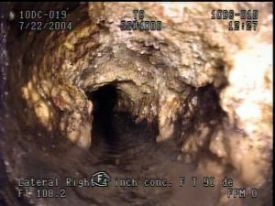 Enhanced sewer maintenance activities are scheduled as a result of our efforts to inspect the sanitary sewer system using a closed circuit video inspection system (CCTV). It is unlawful for any person to deposit by any means whatsoever into any plumbing fixture, floor drain, sand trap, sump, receptacle or device which is connected to any drainage system, public sewer, private sewer, septic tank or cesspool, any garbage, fruit or vegetable paring, ashes, cinders, solids, rags, inflammable, poisonous or explosive liquids or gasses, live steam, oil, grease, or any other substance whatsoever which would or could cause damage to the drainage system or public sewer. This section shall not be construed to prohibit the use of domestic garbage disposal equipment. Do not discharge solvents, caustics, acids, or grease emulsifying agents into sinks, grease trap, or intercepting device. Best Management Practices (BMPs) are a series of activities that effectively manage and control disposal of waste FOG generated from the operation of a FSE. BMPs are utilized to minimize the amount of waste FOG that enters the sewer system. Implementation of BMPs will help FSEs achieve compliance with environmental and regulatory standards. Proper management and disposal of FOG is the foundation for clean kitchen practices. Below are some key BMPs to control waste FOG generated in the kitchen. Provide regular training to employees on proper and consistent implementation of BMPs. Place covers on containers before transporting used oil and grease to recycling barrels. FOG waste can be reclaimed by rendering or recycling companies. Plan ahead and schedule pick-up of rendering/recycling barrels before they are full. Contact a hauling or rendering company to pick up FOG containing barrels before they are full. Waste material can spill when overfilled barrels are moved. The grease interceptor is a device designed to separate and retain FOG and solids from wastewater discharged from the FSE. It is normally a concrete box, usually installed underground, located outside of the FSE's building, and connected to the sewer line serving the FSE. It protects the City sewer system from accumulating FOG and helps prevent sewer blockages. Observe proper grease interceptor cleaning and maintenance procedures to ensure that the device is operating properly. Regular and proper service maximizes interceptor efficiency, prevents spills and minimizes odor. combined thickness of solids at the bottom and FOG material on the surface exceeds 25% of total depth in the interceptor. The frequency of servicing is determined by the accumulation rate of FOG and solids. When necessary, call a pumping company to service (pump down) the grease interceptor. Have a licensed and certified hauling, rendering or pumping company clean, pump down, and service the grease interceptor regularly. Carefully check the interceptor after service to make sure that service was performed correctly. Ensure unrestricted access to the interceptor's sampling box. Keep a maintenance log. The maintenance log serves as a record of the cleaning frequency and can help the FSE manager reduce cost. Keep copies of the cleaning manifests for the Industrial Waste Inspectors to review while conducting inspections. The grease trap is a device designed to separate and to retain FOG from wastewater discharged from the kitchen sinks. It is normally installed under or next to the sink and it helps prevent FSE’s sewer line from clogging. Do not connect dishwashers to grease traps. Discharge from mechanical dishwashers must bypass grease traps. High temperature and large volumes of water from a dishwasher can reduce to efficency of a grease trap by dissolving retained FOG and washing contents of the trap into the sewer line. Do not discharge wastewater with temperatures in excess of 140 degrees F into any grease trap. Temperatures in excess of 140 degrees will dissolve FOG, wash out all contents of a grease trap and send waste FOG into the sewer line. The FOG will re-solidify and cause blockage further downstream in the sewer lines as the wastewater cools off. Clean grease trap routinely. Follow proper grease trap cleaning and maintenance procedures, as recommended by the manufacturer, to ensure that the device is operating properly. Routine cleaning will minimize FOG accumulation and prevent plugging of the sewer line between the FSE and the sanitary sewer system. Clean traps must be cleaned daily. FSE owners and managers should observe grease trap operations during the initial period after installation to determine the required frequency of cleaning during a shift. Skim off the accumulated FOG from grease trap into the recycling barrel daily or more frequently as deemed necessary. This practice maximizes the FOG removal efficiency of the traps and minimizes the amount of FOG “carried off” by the wash water. Use proper equipment for skimming FOG collected in grease trap. Using proper tools to skim off the collected FOG can prevent accidental spills from the grease trap. A spill free workplace is safer for employees and more inviting customers. Baffles are properly reassembled after each cleaning and maintenance. This should include checking the mechanism in the auto-skimmer type grease traps. Flooding or overflowing of the grease trap may be averted if poorly reassembled baffles are quickly discovered and corrected in time. Keep maintenance log to document the frequency of cleaning. The maintenance log serves as a record of the cleaning schedule and can help FSE manager to optimize the unit’s performance. The City’s Industrial Waste Inspector will ask to review these records while conducting inspections. These records will also need to be sent to the city annually to comply with your facility’s self-monitoring program. Train all staff to perform correct cleaning and maintenance procedures. Maintaining the grease trap properly results in successful FOG removal, fewer equipment repairs and fewer spills. Clean vent hood and filters regularly. Have a licensed and certified company clean your vent hood and filters. Waste FOG scraped off, or wiped off, as well as rags, paper towels or other absorbent materials used must be disposed of into trash containers. If water is used in cleaning procedures, it should be discharged into the grease interceptor or hauled away by the service company. Keep maintenance log to document the frequency of service. The maintenance log serves as a record of the cleaning frequency and can help the FSE’s manager reduce cost. Keep copies of the cleaning manifest for the City’s Industrial Waste Inspector to review while conducting inspections.